Circles is the quintessential Thai hot spot in Philadelphia, with locations in South Philly and Northern Liberties. And in honor of the NoLibs’ location launching their new lunch menu (hmm, seems to be a new lunch trend! ), they recently gave away free – yes FREE! – burgers to kick things off. 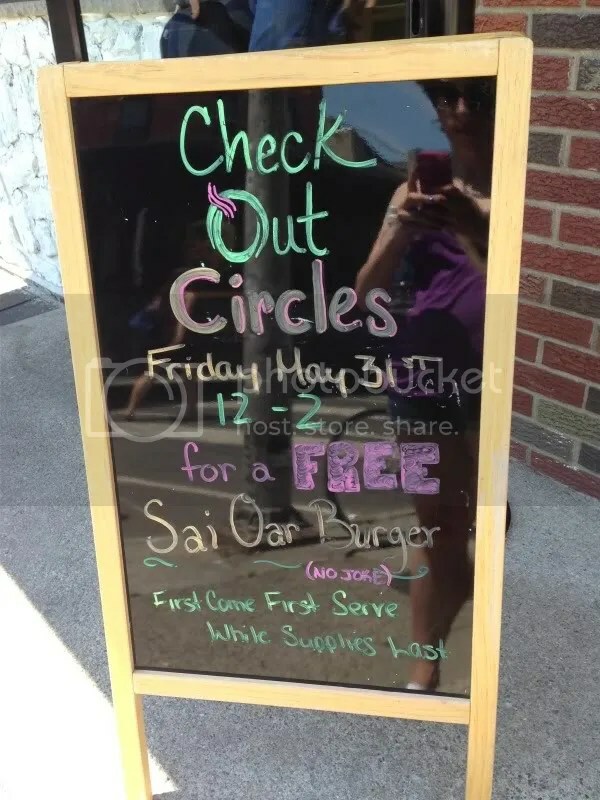 Naturally, I had to be there to check it out and braving a three-day heat wave, I made my way in to Circles just before noon to try their Sai Oar burger: Ground lamb and beef sirloin topped with fried onions, fried egg, lettuce, tomato, onion, cheddar and served with tomatillo sauce. 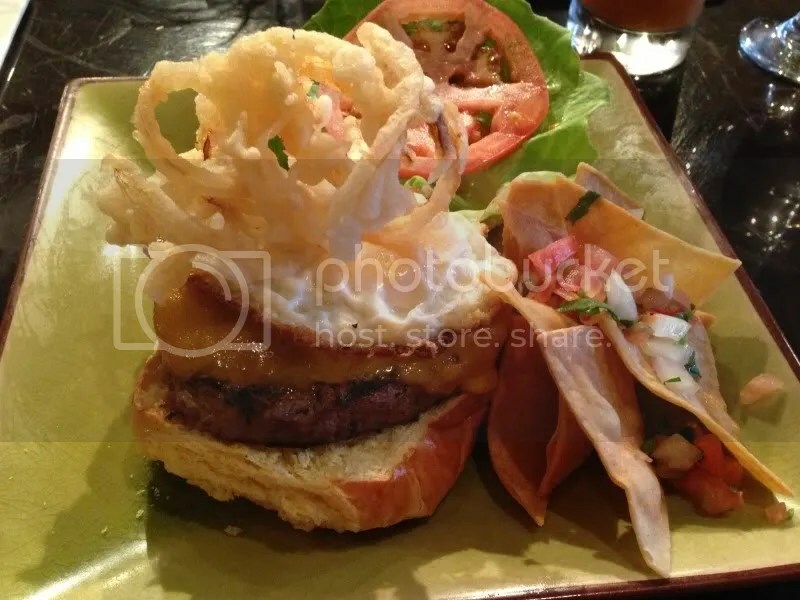 The burger came out with a really cool fried tempura onion on top and a side of chips and pico de gallo. I loved the lamb/meat mix. It made the burger really juicy and succulent, and the fried egg was a great touch (because who doesn’t love a fried egg on a burger?). I love the gooey, yolky mess that you get and can soak up with the bun. There were a lot of really nice flavors throughout the whole dish, from the sweetness of the tomatillo sauce to the crisp tang of cilantro in the pico. I mean, a burger from a contemporary Asian restaurant? Who’da thunk it!? Pair it with a Thai Iced Tea (AKA ‘that orange thing everyone’s drinking’ – said by the guy sitting next to me) and you’ve got yourself an unbeatable lunch combo! Posted in burger, burgers, Circles, egg, lunch, thai. Bookmark the permalink. You’re absolutely right about a fried egg on a burger. Gotta love it! 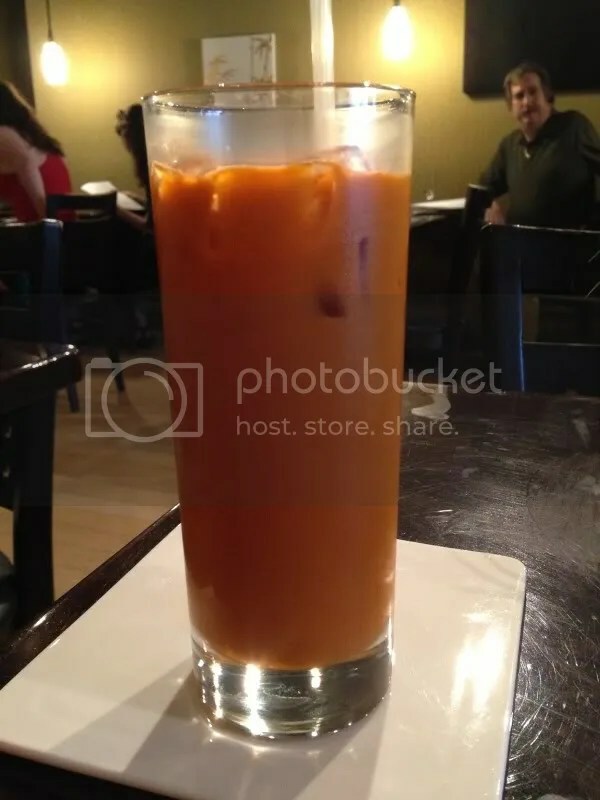 Thai tea + burger?? Hmm…I find that I have to have a carbonated beverage to complete my burger meal. Just helps everything go down a lil easier..